The Garmin Forerunner 610 is an impressive touch screen GPS training watch that uses Virtual Partner and Virtual Racer training modes to help you get the most out of your run, all the while tracking your time, distance, calories, heart rate, and cadence. It has a super resistant touch screen that will work no matter the weather and it uses the latest in wireless technology to upload all of your data to Garmin Connect so you can easily monitor your training on your computer. The Forerunner 610’s touch screen face is sensitive but tough. It can be operated while wearing running gloves and yet it can handle everything from sweat to rain. It’s also easy to use so you don’t have to miss a step to find what you’re looking for. All you need to do to go to the next training page is give it a tap, and adjusting settings and reviewing your run history is as easy as swiping and scrolling. The Forerunner 610 also has some of the best in the latest GPS technology as it accurately measures your pace and tracks your GPS position. And, unlike other GPS watches, it can give you directions back to the starting point of your run so you never have to get lost again while exploring new trails and routes. Some of the advanced features of the 610 are the Virtual Racer which makes your normal run a competition. You can either race against yourself by using old data, or you can challenge others who have uploaded information to Garmin Connect. You will also be able to use Virtual Partner, which helps you see how you compare to a specific static pace that you set for yourself. The Forerunner 610 will then give you a gentle vibration when you reach the goals that you set. You can also set it to alert you when you stray outside of certain heart rate ranges. 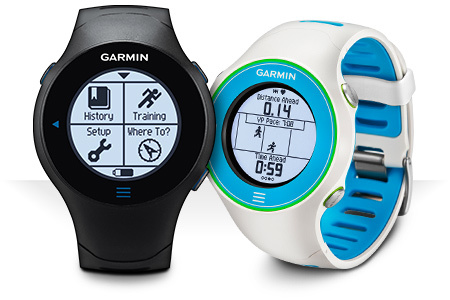 The Garmin Forerunner 610 is the first training watch that uses Training Effect from Firstbeat. Training Effect helps you train as efficiently as possible by measuring the how an activity will affect your fitness based on your user profile, heart rate throughout and activity, and the difficulty of the activity. Garmin Connect is among the best in training tools by allowing you to see all of the data from all of your runs in one place, stored on your computer. The Garmin Forerunner 610 uses wireless upload technology to send all of your run data to Garmin Connect as soon as you are within range of your computer. Some of the things that the Forerunner 610 helps you keep track of with Garmin Connect are maps of your runs as well as your distance, heart rate, and calorie usage. The Forerunner 610 can connect to any ANT+ device such as heart rate monitors and foot pods to track and store data for you. When paired with the Tanita BC-1000 body composition scale, this Garmin sport watch can also track your weight, body fat percentage, muscle mass, metabolic age, and more. This entry was posted in Garmin GPS Running Watch and tagged Garmin, Garmin Forerunner 610, Garmin Forerunner 610 Running GPS Watch Review.